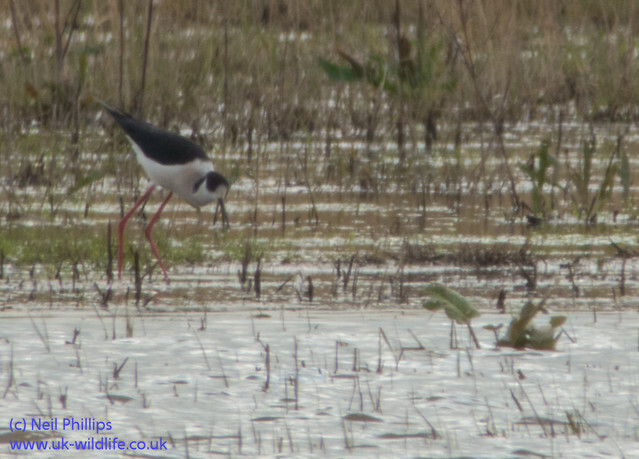 I got a Text today from the wonderful Howard Vaughan informing me that there was a pair of Black Winged Stilts at RSPB Bowers Marsh. They are the first seen in the UK in 2014 I have been told. I was fortunately about to go on my lunchbreak, so popped over to bowers where a small crowd of local birders had gathered to see these lovely birds. They were on the freshwater lagoon, and visible from the first view point, at the end of the path where a red backed shrike was found last year. They were a telescope distance, so I switched to the Pentax Q and adapter on the 300mm set up and took some shots. For this first shot I added the 1.7x teleconverter to give an effective 2805mm focal length. Nice one Neil. Well done!